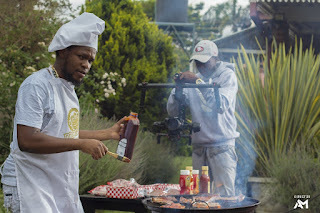 Monkey Bznz’s CEO Sharky hits the ground running in 2018 with his visual single Henaroo, taken off his critically-acclaimed sophomore album Take Back The Land. He links up with the Monkey Bznz fam and fellow Chitungwiza native Director AM (AM Films). In case it goes over your head, they made sure that the video would have a LOT of sauce, literally. How much is too much? I'll let you be the judge of that. DJ Krimz Beatz and Dexter Baysiq also make appearances in the video. The video takes the opportunity to market the Monkey Bznz merchandise and it's safe to say that you will see yours truly rocking the Monkey Bznz K!NG tee (the one Sharky is wearing) soon. Henaroo!! is the first of many videos that we will get from the Take Back The Land album, which is a welcome development and a step up from the Soko Matemai album, whose title track was the only one to get visual treatment.